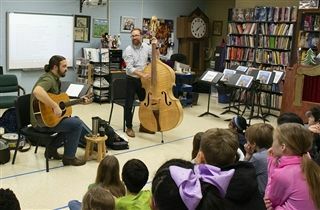 On February 4, Aaron Bibelhauser and Dave Howard from the Kentucky Folk School visited with Jeannine Ary’s fourth grade music students, teaching them about the history of Bluegrass music and the elements of songwriting. Students were introduced to a number of unique instruments and enjoyed singing some familiar Bluegrass music with the musicians. A special thank you to the KCD Fine Arts Guild for sponsoring this event.